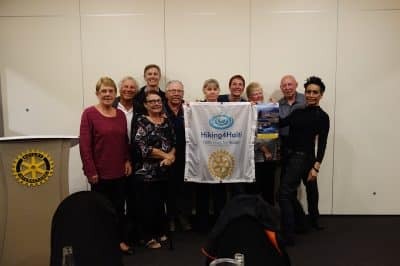 Rotary Club Turangi and Hiking4haiti together for potable water in Haiti! One of the great things with Rotary is, that you feel welcomed and with friends even if you meet the people for the first time. This happened yesterday evening when I joined the Rotary meeting of the Club of Turangi. I was warmly welcomed by the president Paul and all the Members. The club meets Tuesday (1. and 3. of each month) at 6pm at the Tongariro Lodge. What a great evening. We laughed, shared stories and I enjoyed the time there immensely. There was enough time to present the project Hiking4Haiti (fundraising with the goal of bringing 3 communities an access to potable water). After the presentation and all the questions Paul in his role of president announced that the club is going to support Hiking4Haiti with a donation. Very spontaneous and very much appreciated! I want to say thank you to this wonderful people for giving me a wonderful evening and on top of that, supporting our cause.